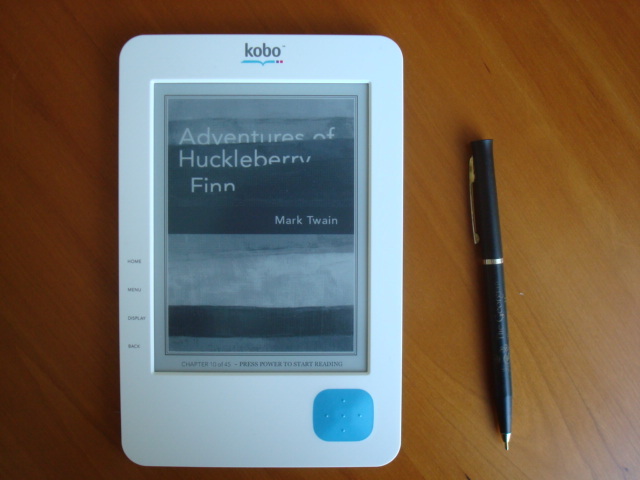 Kobo is a bare bones e-reader. It does not have a wi-fi connection, a built-in dictionary, a keyboard or touch pad. It does not have search or annotation capabilities. It won’t make me scrambled eggs for breakfast, either. All it does is display the text of the book I’m reading, with a minimum of fuss. And that’s all I want, really. Kobo doesn’t even try to replace my laptop; instead, it will replace a few hundred paperbacks that I would otherwise buy in dead tree format and that would take a good chunk out of my ever-shrinking shelf space. It’s small and lightweight, perfect for reading in the park or at the coffeehouse, not to mention travel. It’s comfortable to hold and much easier on my eyes than the laptop. Kobo comes preloaded with 100 public domain books – a nice touch. The Kobo online store has a good selection of current titles, usually priced below the paperback edition. The public domain books often come in several different versions: in addition to the no-frills text available for free download, there can be several “enhanced” editions (illustrated, with historical notes, etc) priced generally between $3 and $10. While Kobo claims to have almost 2 million books available, I wonder if the 17 editions of Pride and Prejudice might count as 17 different books. (Several of the free editions looked exactly identical to me; then again, they’re free, so I’m not complaining. One premium edition cost a whooping $182,19.) A search for Bertolt Brecht produced no results, as did searches for Charles de Coster and Richard Morgan. The disadvantages? It only supports ePub and PDF files, at least for the time being. It’s also a bit slow. When I turn it on, it needs almost a minute to get started and load the book I was reading. Switching between pages takes a second or two, as does scrolling and redrawing the screen. I don’t notice it much when reading ePub books, but unfortunately it does become an issue with PDF files. The screen is small enough that the full width of many PDF documents cannot be accommodated without shrinking the document to the point where the font becomes uncomfortably small. If you increase the size of the font, you’ll have to scroll sideways in the middle of each line, each time waiting a second or two for the screen to redraw. You’ll find soon enough that two seconds can be a long time indeed. 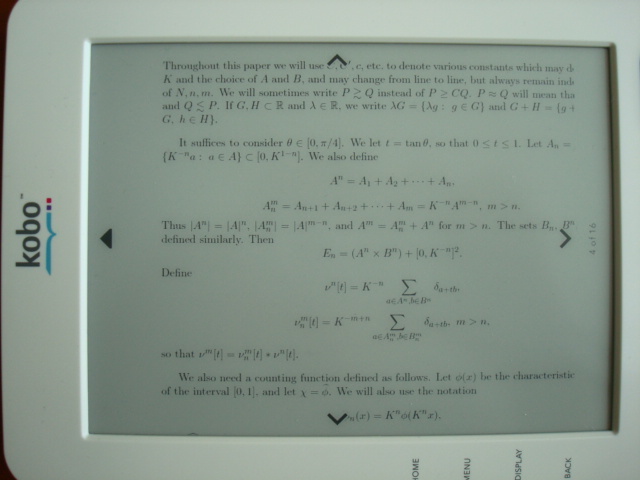 The mathematicians here might be interested to know that PDF files of math papers can be read on the Kobo. Even so, scrolling the pages back and forth within each section can be a pain in the neck thumb, not to mention the horizontal scrolling to get the missing words at the end of lines. (In the example above, it helps that most lines are displayed formulas that don’t run the entire width of the page.) 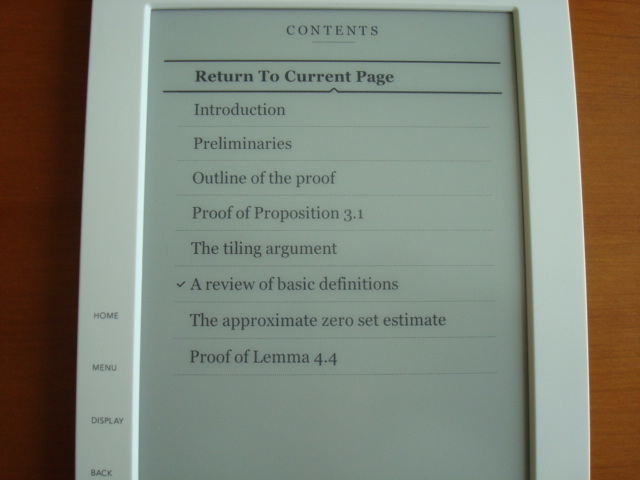 Basically, math papers can be read on the Kobo, but not without considerable effort; I’d prefer either a hard copy or a laptop whenever possible. Then again, when I’m working, I prefer to have a laptop anyway, with a regular keyboard and TEX capabilities. And when I’m on vacation, I don’t need to have my math library with me. I just need a few paperbacks. I haven’t bought it yet, and the pdf feature is my greatest concern as well. I’d like to read medical research papers on this device. I wish it could save me lots of storage space and paper. Thanx for this great review! Thanks for your comment, Jacquelyn! Since I wrote the post, I’ve tried a few more books in PDF format and some of them can be read reasonably well, if not really comfortably, depending on the page width and font size in the original file. Math research papers are about the worst possible sort of thing to read on the device. They tend to have more characters in a line than a paperback book (I’ve just checked; book: ~60 characters per line, math paper: ~80 characters), hence the lines don’t fit on the screen if the font is reasonably large. On the other hand, they’re also full of subscripts, superscripts and other small symbols that can’t be read at all if the font is made smaller. Are medical papers published in a two-column format (i.e. two columns per page, side by side)? If so, I could see how that could work well on a Kobo, having one column at a time on the screen. Also, a few organizing features would be useful. On a Kobo, you cannot organize your files in folders as you would on a computer. The PDF files are listed alphabetically according to the filename. That’s fine when the list is not too long, but not when you have several hundred papers, as I do on my laptop. I have also heard that people have had trouble removing files from the device (I have not yet tried it myself). I just got a Kobo and wanted to put papers on it, too. You may want to take a look at the free program PaperCrop (http://code.google.com/p/papercrop/). It’s designed to take PDFs and automatically reformat them for eReaders. It understands papers in 1 column or 2 column format. I’m still trying it out myself, but it’s definitely a lot better than nothing. Though it is a little extra hassle to reformat all the papers before putting them on the eReader.